Anklets (also known as kolusu and pattilu) have been worn for the longest time within different cultures. For some, the anklet has a significant meaning, while other anklets are worn just for beauty. People enjoy the tinkle of the bells of a dainty anklet payal and wear all types, from a thin silver anklet for everyday wear to a chunkier piece. Indians have worn anklets for centuries. Indian women love wearing some of the most unique, unusual, and at times extravagant anklets featuring lots of tiny chains, bells and charms. Sterling Silver especially is a popular medium for Indian payals. Whether you like simple minimal silver anklet payals or heavy statement anklets for a more festive event, we have one of the largest range of handmade anklet payals, all set in pure 92.5 Sterling Silver. With latest anklet designs merged with traditional influences, Ahilya offers a huge variety of designer silver anklets. If you are a stickler for varied motifs we have the Stylised Mango anklet payal which has keri or mango motif, or the Pushpika Anklet Payal with floral motif. These designs are inspired from traditional Jaipur Rajasthani designs. If you prefer an antique finish for a more vintage look, we have Antique silver coin anklet payal with an oxidized finish which is made of antique silver coins, and makes for a great boho look. There are tribal designs, Temple jewellery from Southern India, ethnic designer pieces, etc. We also have the Mogra Anklet Payal and the Mandala Anklet payal which have a lovely arrangement of beautifully engraved beads, strung together to make regal looking anklets. 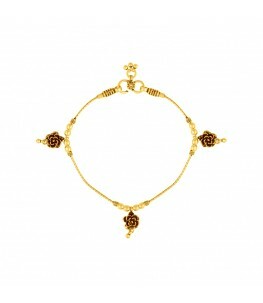 Shop online from the exquisite collection at Ahilya and cherish a beautifully handcrafted anklet!